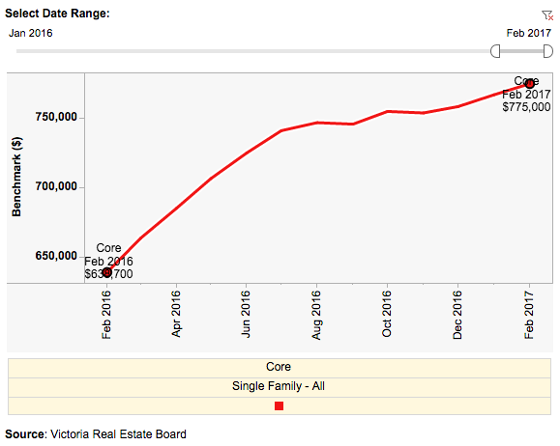 "The Victoria Real Estate Market had a healthy start to 2017. A total of 675 properties sold in the Victoria Real Estate Board region this February, 12.6% fewer than the 772 properties that sold in February last year. Although sales are below where they were a year ago at the same time, sales for February and January were still well above the 10 year average. We won't see the same sales volume this year to meet or beat last year's record breaking numbers due to many factors, including the present lack of inventory and very high demand. There were 1,537 active listings for sale on the Victoria Real Estate Board MLS® at the end of February 2017, which is 40% less than the 2,562 active listings at the end of February 2016. The Provincial Government announced last month that effective February 22nd, first time home buyers will receive a full exemption on Property Transfer Tax for any purchase up to $500,000, and a partial exemption for purchases up to $525,000. This is an increase from $475,000 for a full exemption and $500,000 for a partial exemption which was raised in 2014. Although this isn't a large increase it is a step in the right direction, and hopefully they continue to raise this amount over time, but for first time home buyers this could save you $8,000 on your home purchase of $500,000. The BC Home Partnership Program is also available for first time home buyers now, providing a repayable loan which is interest and payment free for the first 5 years and available on purchases up to $750,000. For full details ..."